Featuring a molded, glass-filled Nylon baseplate, the FUSE-GT is lightweight and responsive, with just the right stiffness and support for all-mountain riding. The ModBack with Aluminum-alloy heelcup transfers energy directly to your board, while the Active Strap Technology and 2.5° canted BankBed footbed with N-Gel offer optimum adjustability, comfort and convenience. The UniBack is a light-weight 1-piece hiback that fully reclines for easy-in and easy-out, and comfortable wrap-around EVA pads reduce the pressure on your legs. 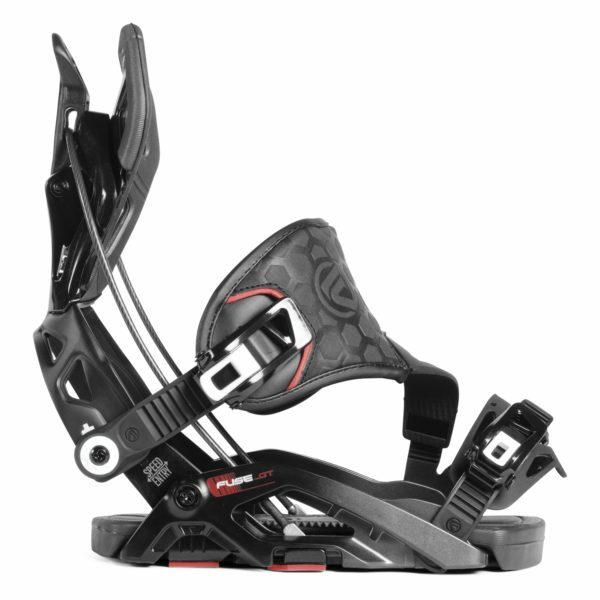 The FUSION PowerStrap is 3-D shaped, fuses the ankle and toe zones over the mid-foot, and is padded for a super comfortable form-fit to your boot. This PowerStrap provides maximum support and energy transmission. These innovative Locking Slap Ratchet (LSR) buckles give you the option to easily get in & out of your bindings any which way you like. Whether Set-it and Forget-it SpeedEntry, or side-entry like a 2-strap, they lock down to secure your preferred footstrap tightness. RIDERS Anyone with an open mind and a desire to fly.